Chinese New Year 2013 is coming up on February 9th, 2013 and lasts for 15 days till Lantern Festival on Sunday, February 24. As we know that Chinese Spring Festival is the most important and grandest traditional festival for Chinese people. Besides, Beijing is the capital of China and one of the most populous cities in the world. It has a long history and most of Chinese traditional customs and culture has survived till today, so Beijing is the first preferred city during Chinese Spring Festival. In addition, if you would like to witness Beijing celebrating its greatest festival, you must be well prepared for your travel, then, you will certainly have an exceptional and amazing experience. Recently the popularity of Nanluogu Xiang (nán luó gǔ xiàng 南锣鼓巷) hutong area has increased noticeably with tourist numbers on the rise following the complete refurbishment of the district in time for the 2008 Olympic Games. Many tourists enjoy taking ride through this 800-year-old hutong that was once home to celebrities, officials, artists and well-off families. There are well over 20 restaurants and 40 shops scattered along Nanluogu Xiang. People seeking a travel experience different to that available from many hotels may like to try some of the cheap hotels or youth hotels in the area. 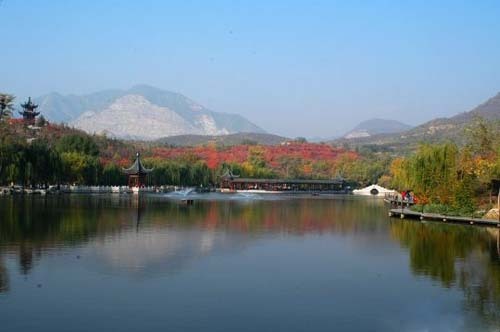 Beigong National Forest Park (běi gōng guó jiā sēn lín gōng yuán 北宫国家森林公园) was constructed in October, 2002, located in the Fengtai District (fēng tái qū 丰台区), west suburb of Beijing City (běi jīng shì 北京市). It covers an area of 9.145 square kilometers. And it is the biggest park whih is closest to the city center. Wuling Mountain (wù líng shān 雾灵山) is located at Miyun District (mì yún qū 密云区), northwest of Beijing (běi jīng 北京). The Wuling Mountain is selected as “the most beautiful mountain of Beijing suburb” by Internet users in 2007. With 2,118 meters above sea-level its main peak is also the main peak of Yanshan Mountain (yān shān 燕山) range. The complexity of terrains and landforms decides its variety of climate. Wuling Mountain was known as Fuling Mountain (fú líng shān 伏凌山) originally. As the mountain is cloudy and foggy all the year round, Fuling Mountain then began to be called Wuling Mountain. It is regarded as the Yellow Mountain (huáng shān 黄山) in North China. Beijing Ancient Observatory (běi jīng gǔ guān xiàng tái 北京古观象台) was first built in 1442 in the Ming Dynasty (míng cháo 明朝) (1368—1644), and was the national observatory in the Ming and Qing Dynasty (qīng cháo 清朝) (1644—1911). It is about 14 meters high with 8 astronomical instruments made in Qing Dynasty. Its rich history spans more than five hundred years, making it one of the most historically interesting observatories in the world. It is also famous for its intact and integrated instruments. The 8 instruments were equipped with western technology and Chinese local art design, and they can show us the exchange between the western and eastern and the magnificent western design. After 1949, Beijing Ancient Observatory became a part of Beijing Planetarium. It is the key national relic protection unit now.